Estimates suggest that by 2050, close to 90% of the developed world will be urbanized. To ensure that our cities are environmentally, economically and socially sustainable, updated solutions that secure the quality of life and safety are needed. Spirit found some inspirational examples. Urban farming, the practice of growing or producing food in a city or heavily populated town, in increasingly popular. Europe’s biggest urban farm is in a former office in The Hague, the Netherlands. Known as UF002 De Schilde, the business produces 45 tons of vegetables and 19 tons of fish in its rooftop greenhouse and fish farm. The idea behind the initiative is to reduce waste and food miles by growing and breeding food where it’s eaten. A green roof is a rooftop where plants are grown to replace the vegetation that was destroyed when the building was constructed. Germany has the greenest roofs in the world. 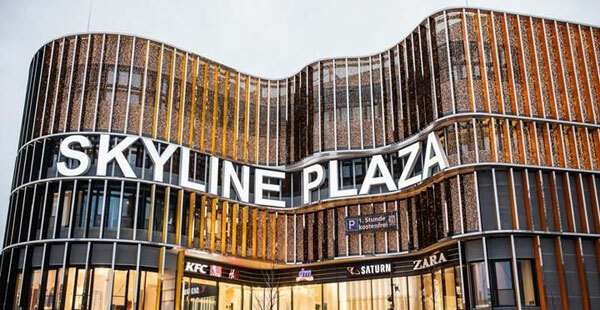 The Skyline Plaza Garden is in the heart of Frankfurt, on top of a shopping mall. It provides an area for people to relax or take part in activities like yoga and table tennis as well as ecosystem services in an urban area, such as storm-water management, regulation of building temperature, reduced the urban heat-island effect and an improved urban habitat for wildlife. The Chinese city of Hangzhou boasts one of the world’s largest public bike-sharing schemes. Approximately 84,100 bikes are available for shared use on a short-term basis, allowing each bike to serve several users per day. Advantages of the initiative include reduced traffic congestion, fuel consumption and emissions as well as improved health benefits and financial savings for users. London was an early adopter of the congestion charge and the scheme is still one of the biggest of its kind. It works by charging a fee on most motor vehicles operating within the Congestion Charge Zone in Central London between 07:00 and 18:00 Mondays to Fridays. Exempt vehicles include all-electric cars and some plug-in hybrids that meet strict emission levels. The charge aims to reduce high traffic flow in the centre of the city, reduce pollution, encourage people to use public transport and raise investment funds for London's transport system. The scheme has successfully reduced traffic volumes. Curitiba is the capital city of the Parana state in Brazil, located on the Upper Iguacu River Basin. The river has a low capacity and has historically flooded frequently. Several factors related to urban growth exacerbated the natural flood risks. To tackle this, the state bought the land along the river and resettled the population to other areas. An artificial channel was dug to increase the river’s capacity, as well as act as a border to prevent growth into the parks and green spaces which provide a natural floodplain. Some areas were reserved for constructed wetlands to improve water quality. A flood warning system was also developed. Planting trees in cities can help cut pollution, conserve energy, increase land value and even make people feel younger. Toronto researchers found that people living on tree-lined streets reported health benefits equivalent to being seven years younger, improved mental health, reduced cases of asthma and fewer low-weight births. The city is working towards the ambitious goal of growing Toronto’s urban forest by 3.8 million trees over a decade. Demands on spaces in cities are constantly changing as a result of economic growth, demographics and consumer preferences. To keep up with these changes and get more from its land, Melbourne has repurposed 86 hectares of underutilized road and other spaces in the last 30 years and aligned new medium to high density residential development around its rail stations and road-based public transport networks. The train system in Hong Kong – known as the Mass Transit Railway (MTR) – is one of the best in the world. It has a punctuality record as well as cleanliness and efficiency levels that rival systems can only dream of – around 99.9% of trains run on time. The key to Hong Kong’s success is a business model called ‘Rail plus Property’. The MTR builds a new rail line and partners with private developers to build properties around the new line. MTR receives a share of the developers’ profits and it uses the money to fund operations, maintenance and new rail projects. Singapore is recognized as a model city for water management. With a rising population and finite freshwater resources, innovative water solutions were needed to secure the country’s future water supply. Singapore now takes advantage of three water management innovations: reuse of reclaimed water, rainwater catchment systems and saltwater desalination. Two thirds of Singapore’s land surfaces are now water catchment areas, with water stored in 17 reservoirs, including the Marina Basin in the heart of the city. Wastewater is collected and treated to produce water that’s good enough to drink. This water is called NEWater and it currently meets 40% of the city’s water needs, by 2060 it is expected to supply up to 55% of Singapore’s future water demands. Medellin was once considered one of the most dangerous cities in the world, ruled by drug trafficking and other crime. It has now been transformed after focusing on mobility infrastructure as a means of improving social inequality and reducing poverty and violence. A cable car system and giant hillside escalators were constructed to connect low income, marginalized communities in the hillsides to the wealthier city center. The urban renewal project also included creating new public spaces and health, education and sports facilities in the poorest communities.